The Cleveland Browns announced a relative bombshell move this early in the offseason Monday, signing ex-Chiefs running back Kareem Hunt in a move that muddies the fantasy football waters more than anything else. 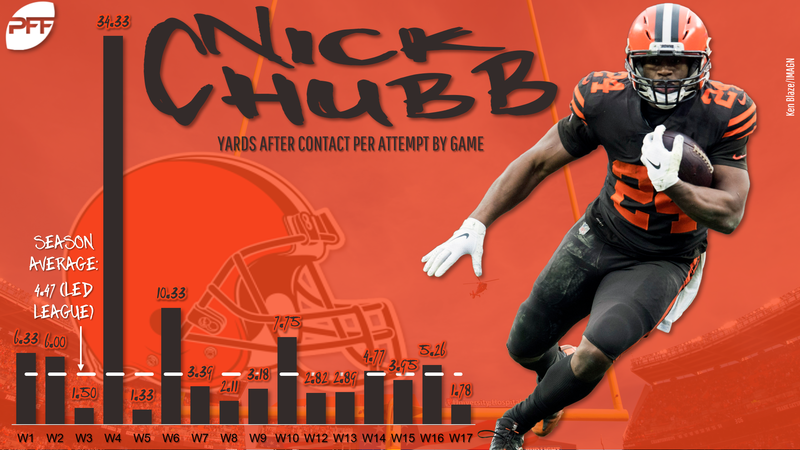 Hunt joins a backfield that also includes Duke Johnson and 2018 rookie Nick Chubb, giving the Browns an increasingly impressive list of weapons in an overhauled offense under new head coach Freddie Kitchens. He spent the 2017 and 2018 seasons as the Chiefs’ No. 1 running back before being released by the team late in last season amid a domestic violence investigation. Chubb performed well for the Browns last season, finishing the year with the single highest overall PFF grade among running backs (87.5) and leading all qualified backs in yards after contact per carry at 4.47. His full-season totals (996 rushing yards, 149 receiving, PPR RB17) were impressive, all the more because Chubb spent the first six weeks of the season behind ex-Brown Carlos Hyde on the depth chart — he didn’t top 11 snaps in a game and only had 33 total into Week 7. After the trade of Hyde to Jacksonville Chubb was fantasy’s RB8 the rest of the way. Hunt, a third-round pick in 2017, jumped to the top of the Chiefs’ depth chart that year after a preseason injury to Spencer Ware. He had a monster start to his career, putting up 246 scrimmage yards and 3 touchdowns in his first career game and scoring six times in his first three weeks. He was fantasy’s RB4 in 2017, coming in fifth in PFF grading. His 2018 went similarly, sitting as fantasy’s RB5 and sixth in grading as of his release after Week 11. The Browns also have Johnson, who was RB11 in 2017 before losing playing time to Chubb and Hyde in 2018. Primarily a receiving back, Johnson had 90 targets and 74 receptions in 2017 (both fourth among running backs) but saw those numbers fall to 61 and 47, respectively, in 2018. The first thing to know about the impact of this move on the 2019 fantasy season is that we don’t know enough yet. Now that he’s on a team, Hunt will land on the Commissioner’s Exempt List as the league decides what sort of suspension, if any, to hand to the running back following his incident. The typical suspension in this sort of situation is six games, but whether that happens here and when it begins and ends is still a mystery. That complicates things, of course. If we knew Hunt would be active from Week 1, it would stand to reason the Browns might look to move on from Johnson and explore his trade market. But for however long Hunt is out, the team’s backfield as currently constructed will be Chubb, Johnson, and even greater question marks. For now, Chubb — who this time yesterday had a strong argument to be a first-round fantasy pick and wouldn’t have fallen past the early second — now sees his stock take a hit. He didn’t have huge involvement in the team’s passing game last year, with only 28 targets and a subpar 52.4 PFF pass-blocking grade, and while Hunt wasn’t exactly Darren Sproles himself, his superior pass-blocking grade could have him supplanting Chubb as a protector for QB Baker Mayfield even if Johnson isn’t around. And of course Hunt’s ceiling is much lower after leaving a situation in Kansas City where he was the bell cow to now serve in a committee. Until suspension info comes down, it will be hard to assign hard-and-fast draft stock to any of these guys, but if drafting early, Chubb falls to a low-end RB2, with Hunt a decent flex option on a per-game basis. Considering his possible-to-likely suspension, he’s a later-round pick, but obviously one with significant upside if and when he sees the field, and significant risk with a possible six-game (or longer) suspension looming. As for Johnson, he’s nearly undraftable at this point, only a real option in deep PPR leagues.